The new Senator Chronometer from Glashütte Original combines the austere elegance of a dial inspired to marine chronometers of the past with an eye-catching and modern dark blue hue which enhances the character of the timepiece. 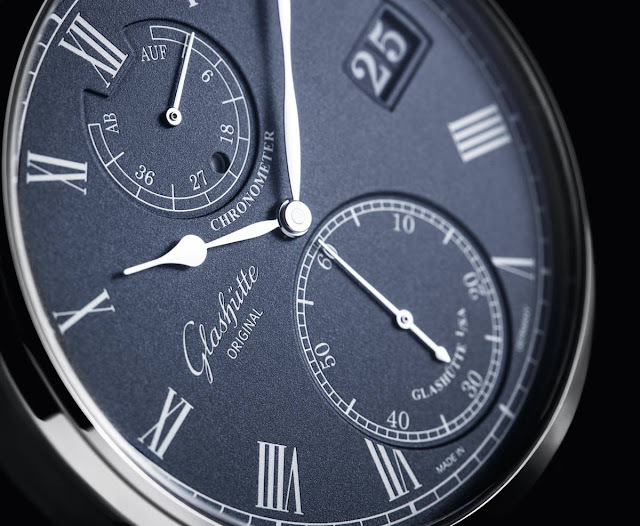 The Senator Chronometer Blue Dial, like all Glashütte Original timepieces, is carefully tested internally to make sure it satisfies the highest quality standards. 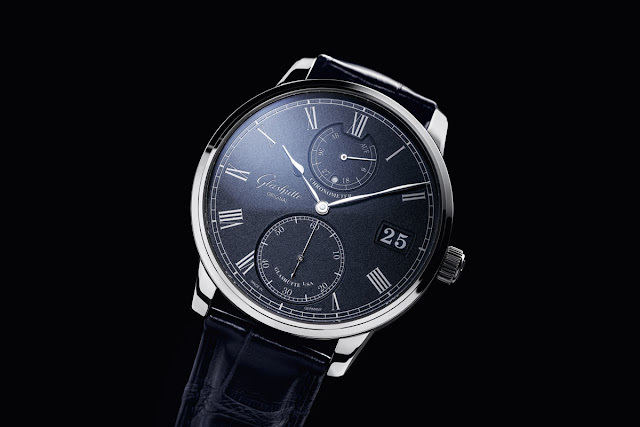 Additionally, it provides further evidence of its precision in the form of official certification as a chronometer by the German Calibration Service. The dark blue tone of the dial emphasises the finely grained and lacquered surface, a result which is achieved by applying and drying several coats of lacquer in a delicate process which experienced craft specialists perform in the firm's own dial factory in Pforzheim. Long, slim "poire" hands in polished white gold creates an ideal contrast against the deep blue. The railroad chapter ring, the indexes and numerals are engraved and galvanised in silver. The power reserve and small seconds displays are slightly recessed into the surface of the dial creating a pleasing multi-level effect. The 42 mm white gold case has a slim bezel to leave more space to the dial and guarantee perfect legibility of the indications, including the small seconds at 6 o'clock and the power reserve display at 12 o'clock. At 3 o'clock, the colour-matched Panorama Date is nicely integrated, along with a separate day-night display that simplifies setting of the date and is positioned in a round opening above the centre: from 6 in the morning until 6 in the evening the small circle appears in white, from 6 in the evening on, in black. 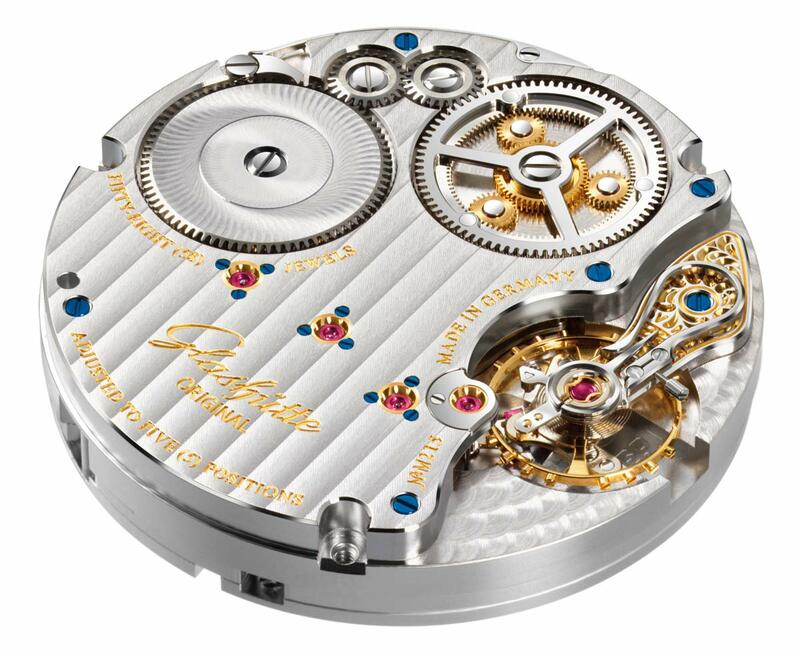 The 4 Hz (28,800 vph) Calibre 58-01 is hand-wound and offers more than 44 hours of power reserve. 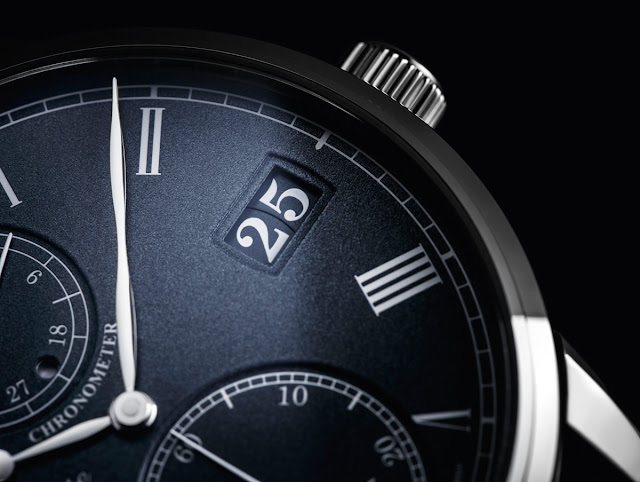 Thanks to the second-stop mechanism, when the crown is pulled out, the time display stops, the seconds hand is reset to zero and simultaneously the minute hand jumps ahead to the next full minute index. As the crown is turned to set the time, the hand always jumps to the next minute index. The Glashütte three-quarter plate is decorated with stripe finish, bevelled/polished edges and polished/blued screws. 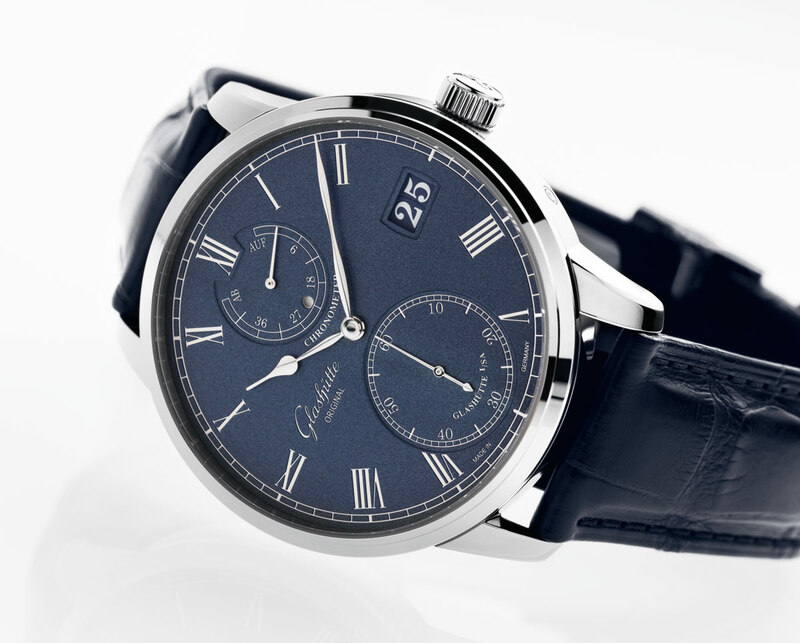 Glashütte Original Senator Chronometer Blue Dial. 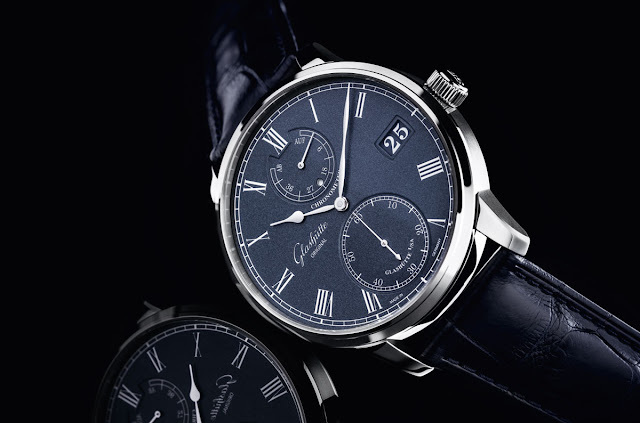 The new Senator Chronometer from Glashütte Original combines the austere elegance of a dial inspired to marine chronometers of the past with an eye-catching and modern dark blue hue which enhances the character of the timepiece. 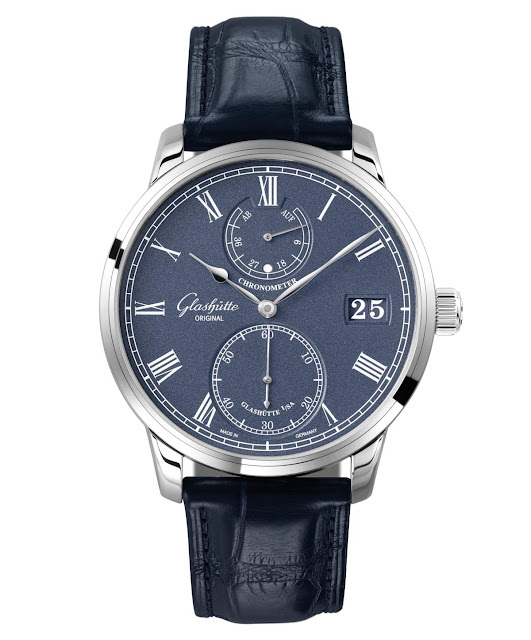 The Glashütte Original Senator Chronometer Blue Dial (ref. 1-58-01-05-34-30) has a price of around Euro 27,200 / US$ 32,200.